A truck stops Sunday morning on Birch Avenue in Ellsworth after the driver sees a tree blocking the roadway. Strong winds and heavy rains swept through the already soggy state Saturday, leaving tens of thousands of customers without power Sunday morning. Central Maine Power reported a peak of 38,000 customers without power. Over the course of the storm, a total of 56,300 of their customers were affected, with the majority of outages in Franklin, Somerset and Waldo counties. By 6 a.m. Monday, utility crews had reduced that number to 13,000 outages. Western Maine felt the most lingering effects of the outage. Franklin County still had more than 1,700 customers without power, while Somerset County had just less than 1,000 at 6 a.m. Monday. Emera Maine reported a peak of nearly 44,000 customers without power because of the storm, with the majority of outages in Hancock, Aroostook and Penobscot counties. By 6 a.m. Monday, the company had reduced that number to just more than 3,000. Of those still without electricity Monday morning, Hancock County topped the list with more than 1,600, followed by Penobscot County at roughly 870. A chief concern was the many power lines that were knocked down by wind and fallen trees. Emera addressed more than 100 reports of downed lines first to ensure public safety. CMP, too, made downed lines a priority. “Our crews were kept busy overnight working to keep the public safe from downed lines, clearing trees and limbs from roads, and lining up our resources to start the full restoration at first light this morning,” Elwell said in a prepared statement. CMP called in local contractors and outside crews from around New England for assistance. As of Sunday morning, more than 200 line crews were in the field, assisted by pole-setting crews, tree crews and a damage assessment team. 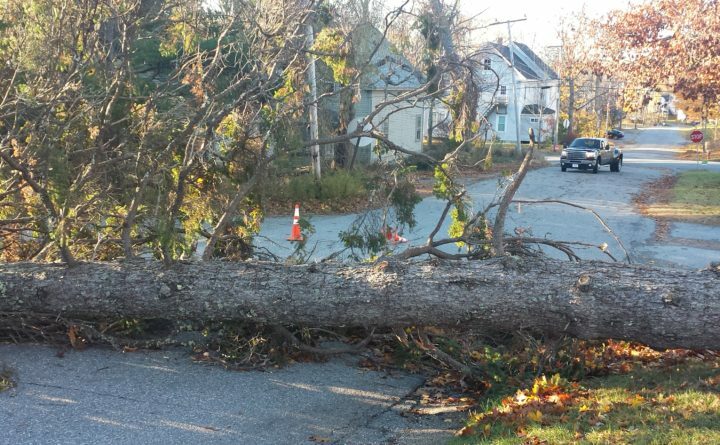 Emera reported 70 crews in the field, along with with tree crews and support staff. The National Weather Service in Gray reported sunny skies all day Sunday for southern Maine, except for a few clouds in the mountains, and temperatures a few degrees below average. The weather service’s Caribou office advised people in northern Maine on Sunday to be aware of wind gusts from the west, but those gusts were expected to ease by Sunday afternoon. Monday’s forecast is tranquil, with partly sunny skies, but more rain is predicted for Tuesday, with gusty winds returning to the state Wednesday.